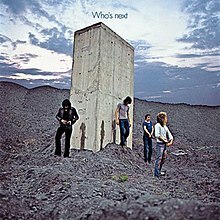 "Who's Next" is the fifth studio album by English rock band The Who. It developed from the aborted Lifehouse project, a multi-media rock opera written by the group's Pete Townshend as a follow-up to the band's 1969 album "Tommy". The project was cancelled due to its complexity and conflicts with Kit Lambert, the band's manager, but Townshend was persuaded to record the songs as a straightforward studio album. The Who recorded "Who's Next" with assistance from recording engineer Glyn Johns. After producing the song "Won't Get Fooled Again" in the Rolling Stones Mobile Studio, they relocated to Olympic Studios to record and mix most of the album's remaining songs. They made prominent use of the synthesizer on the album, particularly on "Won't Get Fooled Again" and "Baba O'Riley", which were both released as singles. The cover photo was shot by Ethan Russell and made reference to the monolith in the 1968 film 2001: A Space Odyssey, as it featured group members having urinated against a concrete piling protruding from a slag heap. "Who's Next" was an immediate success when it was released in August 1971. It has since been viewed by many critics as the Who's best record and one of the greatest albums of all time. It was reissued on CD several times with additional songs originally intended for "Lifehouse". By 1970, the Who had obtained significant critical and commercial success, but they had started to become detached from their original audience. The mod movement had vanished, and the original followers from Shepherds Bush had grown up and acquired jobs and families. The group had started to drift apart from manager Kit Lambert due to his preoccupation with their label, Track Records. They had been touring since the release of "Tommy" the previous May, with a set that contained most of that album, but realized that millions had now seen their live performances, and Pete Townshend in particular recognized that they needed to do something new. A single, "The Seeker", and a live album, "Live at Leeds" were released in 1970, and an EP of new material ("Water", "Naked Eye", "I Don't Even Know Myself", "Postcard" and "Now I'm a Farmer") was recorded, but not released as the band felt it would not be a satisfactory follow-up to "Tommy". Instead, the group tackled a project called "Lifehouse". This evolved from a series of columns Townshend wrote for Melody Maker in August 1970, in which he discussed the importance of rock music, and in particular what the audience could do. Of all the group, he was the most keen to use music as a communication device, and wanted to branch out into other media, including film, to get away from the traditional album / tour cycle. Townshend has variously described Lifehouse as a futuristic rock opera, a live-recorded concept album and as the music for a scripted film project. The basic plot was outlined in an interview Townshend gave to Disc and Music Echo on 24 October 1970. "Lifehouse" is set in the near future in a society in which music is banned and most of the population live indoors in government-controlled "experience suits". A rebel, Bobby, broadcasts rock music into the suits, allowing people to remove them and become more enlightened. Some elements accurately describe future technology; for example, The Grid resembles the internet and "grid sleep" virtual reality. Pete Townshend was given a Gretsch 6120 guitar from Joe Walsh in early 1971, and it became his main electric instrument for Who's Next. The group held a press conference on 13 January 1971, explaining that they would be giving a series of concerts at the Young Vic theatre, where they would develop the fictional elements of the proposed film along with the audience. After Keith Moon had completed his work on the film 200 Motels, the group performed their first Young Vic concert on 15 February. The show included a new quadrophonic public address which cost £30,000 and the audience was mainly invited from various organisations such as youth clubs, with only a few tickets on sale to the general public. 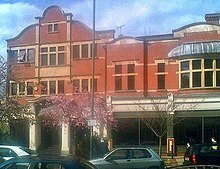 After the initial concerts, the group flew to New York's Record Plant Studios at Lambert's suggestion, for studio recordings. The group were joined by guests Al Kooper on Hammond organ, Ken Ascher on piano and Leslie West on guitar. Townshend used a 1957 Gretsch guitar, given to him by Joe Walsh, during the session and it went on to become his main guitar for studio recording. Lambert's participation in the recording was minimal, and he proved to be unable to mix the final recordings. After returning to Britain, engineer Glyn Johns made safety copies of the Record Plant material but decided that it would be better to re-record it from scratch at Olympic Sound Studios in Barnes. The group gave a further series of concerts at the Young Vic on 25 and 26 April, which were recorded on the Rolling Stones Mobile Studios by Andy Johns, but Townshend grew disillusioned with Lifehouse and further shows were cancelled. The project proved to be intractable on several levels and caused stress within the band as well as a major falling out between Townshend and Lambert. Years later, in the liner notes to the remastered CD, Townshend wrote that the failure of the project led him to the verge of a nervous breakdown. Audiences at the Young Vic gigs were not interested in interacting with the group to create new material, but simply wanted the Who to play "My Generation" and smash a guitar. At the time, Roger Daltrey said the Who "were never nearer to breaking up". Although the Lifehouse concept was abandoned, scraps of the project remained in the final album, including the use of synthesizers and computers. An early concept for Lifehouse featured the feeding of personal data from audience members into the controller of an early analogue synthesizer to create a "universal chord" that would have ended the proposed film. Abandoning Lifehouse gave the group extra freedom due to the absence of an overriding musical theme or storyline (which had been the basis of Tommy). This allowed the band to concentrate on maximising the impact of individual tracks, and providing a unifying sound for them. Although he gave up his original intentions for the Lifehouse project, Townshend continued to develop the concepts, revisiting them in later albums, including a 6-CD set, The Lifehouse Chronicles in 1999. In 2007 he opened a website called The Lifehouse method to accept personal input from applicants that would be turned into musical portraits. The first session for what became Who's Next was at Mick Jagger's house, Stargroves, at the start of April 1971, using the Rolling Stones Mobile. The backing track of "Won't Get Fooled Again" was recorded there before the band decided to relocate recording to Olympic at Johns' suggestion; the first session was on 9 April, attempting a basic take of "Bargain". The bulk of the sessions occurred during May, when the group recorded "Time is Passing", "Pure and Easy", "Love Ain't For Keeping" (which had been reworked from a rock track into an acoustic arrangement), "Behind Blue Eyes", "The Song is Over", "Let's See Action" and "Baba O'Riley". Nicky Hopkins guested on piano, while Dave Arbus was invited by Moon to play violin on "Baba O'Riley". John Entwistle's "My Wife" was added to the album at the last minute late in the sessions, and was originally intended for a solo album. In contrast to the Record Plant and Young Vic sessions, recording with Johns went well as he was primarily concerned about creating a good sound, whereas Lambert had always been more preoccupied about the group's image. Townshend recalled, "we were just getting astounded at the sounds Glyn was producing". Townshend used the early synthesizers and modified keyboard sounds in several modes: as a drone effect on several songs, notably "Baba O'Riley" and "Won't Get Fooled Again", as well as on "Bargain", "Going Mobile" and "The Song Is Over". The synthesizer was used as an integral part of the sound, as opposed to providing gloss as was the case on other artists' albums up to this point. Moon's drumming had a distinctly different style from earlier albums, being more formal and less reliant on long drum fills – partly due to the synthesizer backing, but also due to the no-nonsense production techniques of Johns, who insisted on a good recording performance that only used flamboyancy when truly necessary. Johns was instrumental in convincing the Who that they should simply put a single studio album out, believing the songs to be excellent. The group gave him free rein to assemble a single album of whatever songs he wanted in any order. Despite Johns' key contributions, he only received an associate producer credit on the finished album, though he maintained he acted mainly in an engineering capacity and based most of the arrangements on Townshend's original demos. The album opened with "Baba O'Riley", featuring piano and synthesizer-processed Lowrey organ by Townshend. The song's title pays homage to Townshend's guru, Meher Baba, and minimalist composer Terry Riley (and is informally known as "Teenage Wasteland" from a line in the lyrics). The organ track came from a longer demo by Townshend, portions of which were later included on a Baba tribute album "I Am", that was edited down for the final recording. Townshend later said this part had "two or three thousand edits to it". The opening lyrics to the next track, "Bargain", "I'd gladly lose me to find you", came from a phrase used by Baba. Entwistle wrote "My Wife" after having an argument with his wife and exaggerating the conflict in the lyrics. The track features several overdubbed brass instruments recorded in a single half-hour session. "Pure and Easy", a key track from Lifehouse, did not make the final track selection, but the opening line was included as a coda to "The Song is Over". The cover artwork shows a photograph, taken at Easington Colliery, of the band apparently having just urinated on a large concrete piling protruding from a slag heap. The decision to shoot the picture came from Entwistle and Moon discussing Stanley Krubrick and the film 2001: A Space Osyssey. According to photographer Ethan Russell, most of the band members were unable to urinate, so rainwater was tipped from an empty film canister to achieve the desired effect. The rear cover showed the band backstage at De Montfort Hall, Leicester, amongst a debris of furniture. In 2003, the television channel VH1 named Who's Next's cover one of the greatest album covers of all time. The lead single, "Won't Get Fooled Again" (edited down to three and a half minutes), was released on 25 June 1971 in the UK and 17 July in the US ahead of the album. It reached #9 and #15 in the charts respectively. The album was released in August in the US and on 27 August in the UK. It became the only album by the Who to top the UK charts. The Who starting touring the US just before the album was released. The group used the Lifehouse PA, though soundman Bob Pridden found the technical requirements of the equipment to be over-complicated. The set list was revamped, and while it included a smaller selection of numbers from "Tommy", several new numbers from the new album such as "My Wife", "Baba O'Riley" and "Won't Get Fooled Again" became live favourites. The latter two songs involved the band playing to a backing track containing the synthesizer parts. The tour moved to the UK in September, including a show at The Oval, Kennington in front of 35,000 fans, and the opening gig at the Rainbow Theatre in Finsbury Park, before going back to the US, ending in Seattle on December 15. The group then took eight months off touring, the longest break of their career at that point. Several additional songs recorded at the Who's Next sessions were released later as singles or on compilations. "Let's See Action" was released as a single in 1971, followed by "Join Together" in June 1972 and "Relay" in November. "Pure and Easy", "Put The Money Down" and "Too Much of Anything" were released on the album "Odds and Sods", while "Time is Passing" was added to the 1998 CD version. A cover of "Baby Don't You Do It" was recorded and the longest version currently available is on the deluxe edition of the album. In a contemporary review for The Village Voice, music critic Robert Christgau called "Who's Next" "the best hard rock album in years" and said that, while their previous recordings were marred by a thin sound, the group now "achieves the same resonant immediacy in the studio that it does live". Billy Walker from Sounds highlighted the songs "Baba O'Riley", "My Wife", and "The Song Is Over", and wrote, "After the unique brilliance of Tommy something special had to be thought out and the fact that they settled for a straight-forward album rather than an extension of their rock opera, says much for their courage and inventiveness." Rolling Stone magazine's John Mendelsohn felt that, despite some amount of seriousness and artificiality, the album's brand of rock and roll is "intelligently-conceived, superbly-performed, brilliantly-produced, and sometimes even exciting". At the end of 1971, the record was voted the best album of the year in the Pazz and Jop, an annual poll of American critics published by The Village Voice. Since then, "Who's Next" has often been viewed as the Who's best album. In a retrospective review for AllMusic, Stephen Thomas Erlewine said its music was more genuine than "Tommy" or the aborted Lifehouse project because "those were art – [Who's Next], even with its pretensions, is rock & roll." BBC Music's Chris Roberts cited it as the band's best record and "one of those carved-in-stone landmarks that the rock canon doesn't allow you to bad-mouth." 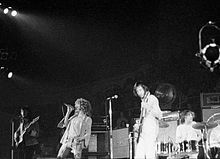 Mojo claimed its sophisticated music and hook-laden songs featured innovative use of rock synthesizers that did not weaken the Who's characteristic "power-quartet attack". In The Encyclopedia of Popular Music (1998), Colin Larkin said it raised the standards for both hard rock and the Who, whose "sense of dynamics" was highlighted by the contrast between their powerful playing and a counterpoint produced at times from acoustic guitars and synthesizer obbligatos. Christgau, on the other hand, was less enthusiastic about the record during the 1980s when the Who became what he felt was "the worst kind of art-rock band", writing that Who's Next revealed itself to be less tasteful in retrospect because of Daltrey's histrionic singing and "all that synth noodling". According to Acclaimed Music, "Who's Next" is the 35th most ranked record in critics' lists of the all-time greatest albums. In 2003, Rolling Stone ranked it 28th on its list of the 500 greatest albums of all time. The album appeared at number 15 on Pitchfork Media's list of the 100 best records from the 1970s. It was also included in the book 1001 Albums You Must Hear Before You Die (2005). The Classic Albums BBC documentary series aired an episode on "Who's Next", initially on radio in 1989, and then on television in 1998, which was released in 2006 on DVD as Classic Albums: The Who - Who's Next. That year, the album was chosen by Time as one of their 100 best records of all time. In 2007, it was inducted into the Grammy Hall of Fame for "lasting qualitative or historical significance". Pete Townshend – guitar, VCS3, organ, A.R.P. Synthesizer, vocals, piano on "Baba O'Riley"
Al Kooper – organ on alternate version of "Behind Blue Eyes"
Leslie West – lead guitar on "Baby, Don't You Do It"
UK Track 2408 102 Deluxe stereo (1971). The album's original headhunter inner sleeve is absent.